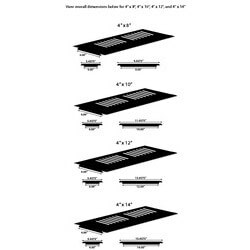 94" x 0.5" x 6"
94" x 0.5" x 4"
94" x 3.5" x 0.75"
94" x 0.468" x 0.75"
94" x 3.125" x 0.745"
94" x 0.44" x 3.5"
94" x 0.75" x 0.75"
78" x 3.125" x 0.745"
78" x 2.262" x 0.745"
78" x 2.125" x 0.53"
78" x 2" x 0.31"
60" x 11.5" x 0.75"
48" x 7.5" x 0.25"
48" x 11.5" x 0.75"
48" x 3.125" x 0.745"
12" x 4" x 0.75"
12" x 4" x 0.39"
10" x 4" x 0.39"
SURFACE MOUNT VENTS (Drop-in Vents) easily drop into the duct opening, and with a rounded surface overlap, covers any rough edges in the floor. Available with or without metal dampers to moderate and direct air flow. Installation tip: Because these wood moldings are made from a natural material, variation in wood grain and color in different pieces is to be expected. 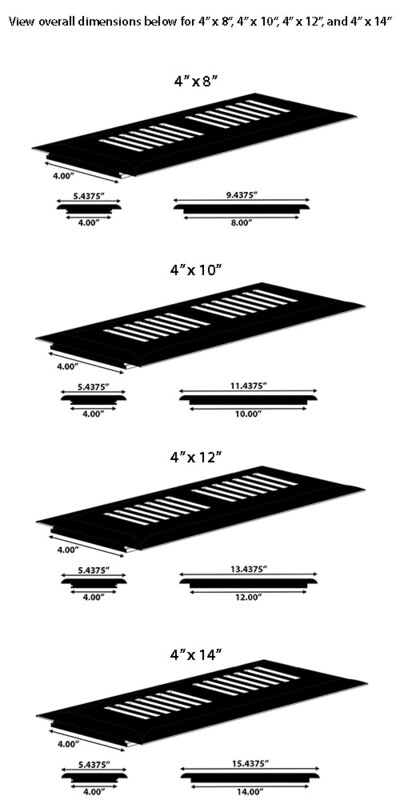 Whether you want either a uniform or variated look between your moldings and flooring, we suggest having the installer sort through floor planks prior to installation to select end boards that best pair with the look you’re after. Pre-selecting flooring that will lay next to your moldings before installation will ensure an exceptional result that meets, or even exceeds, your expectations. Please also note that these moldings are made to order, only after the order is place. This production time is taken into consideration when estimating shipping timelines, so please expect a longer lead time for the production of these custom made products. Also, as with all of our special order products that are custom made, our 30 Day Money Back Guarantee does not extend to these custom made products.